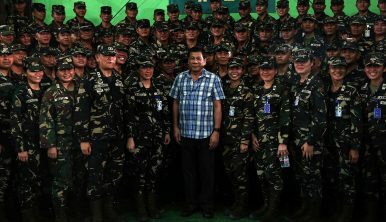 Philippine President Rodrigo Duterte, pictured here with Philippine troops. What Will 700 New Drones Mean for the Philippines? A look at the boost’s potential significance. Earlier this month, the Philippines’ police chief confirmed that the country would be getting around 700 drones in the next few months. While specifics remain unclear, the disclosure has nonetheless spotlighted Manila’s accelerated efforts to boost its surveillance capabilities in the face of rising manifold security challenges at home and abroad. As I have noted before in these pages, the Philippines has long faced a challenge of both confronting a range of security threats at home and abroad as well as having significant gaps in its capabilities to address them. The siege by Islamic State-backed militants in the southern city of Marawi last year had once again spotlighted this, and one of the gaps in that respect had been surveillance capabilities. Since then, we have seen the Philippine government accelerate already ongoing efforts to purchase more drones to boost its capabilities in this realm. Indeed, while headlines tend to focus on occasional hype around specific surveillance activities or individual deals, the more significant trend has been the growing attention Manila has given to investing more in drones. Earlier this month, drones were in the spotlight again within the Philippine context with the confirmation by the Philippine police chief that it had acquired more drones to boost security. According to Philippine National Police (PNP) chief Director General Oscar Albayalde in his comments to reporters on October 18, about 700 drones, worth 56 million Philippine pesos at a unit price of 80,000 pesos each, were set to be developed and deployed to various units and provincial mobile groups. Per the Philippine News Agency (PNA), Albayalde said the drones would be used to tackle a variety of threats, from terrorism to communist rebels. He cast the deploying of drones across units as being significant because they would not only help boost aggregate surveillance capabilities critical to addressing security challenges, but also help make the issuance of drones a standard procedure which it is currently not. Albayalde did not really offer much in the way of publicly issued specifics, such as when exactly these drones would be fully given out to these units – the rough timeline is later this year or early 2019 – and what the distribution of the drones would be across these different units as well. Such details would be important for any true assessment of the significance of developments such as these. Furthermore, for all the focus on equipment, Manila’s security challenges lie in other areas, from the capacity of its personnel to the procurement process to interagency coordination. Still, the procurement of these drones and the gradual issuance of them within various Philippine units is not without significance given both the limitations Manila has with respect to its capabilities as well as the ongoing security threats it confronts at home and abroad.